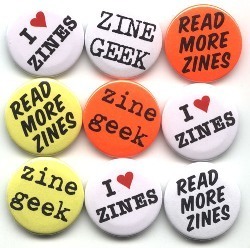 We've already declared our love for London's thriving small press scene, this Saturday, 29 May is the day for the more unruly world of fanzines to shake, rattle and roll at the London Zine Symposium this at the Rag Factory on Henage Street, off Brick Lane. Like the world of fanzines itself the event, now in its fifth year, promises to be exciting, exuberant, edgy and inspiring with maybe a little madness, fury and crooked sexiness chucked in there too. We couldn't find timing on the website but there's zine readings at 2pm including ones from veganisms nicest anarchist cartoonist Isy of Morgenmuffel zine, charming young gent-about-town Patrick Staff of Ricochet Ricochet fanzine and the lovely yet brilliant yet funny yet lovely presence of Josie Long who does Drawing Moustaches in Magazines Monthly. There's also workshops and discussion, a chance to make your own artistic trading cards and many many tables laden with angry, arty and funny fanzines and comics. A fine way to spend a few hours of a (probably) rainy bank holiday Saturday. The Pride of Spitalfields pub, just along Henage Street, is a strange old fashioned, non-Spitalfields-ish boozer to examine your fanzine finds afterwards too. The cat is very friendly.